He has traveled to many ancient sites to photograph the water-related facilities. One of his major efforts has been the study of ancient water systems and the relation that these systems could have on solving our problems of water resources sustainability using the concepts of traditional knowledge. Professor Mays’ academic career has spanned over a 43 year time period, starting at the University of Texas in Austin in 1976 followed by the last 30 years at Arizona State University where he has been a Professor of Civil and Environmental Engineering in the School of Sustainable Engineering and the Built Environment since August 1989. He served as Chair of the Civil and Environmental Engineering Department from August 1989 until July 1996. Prior to that, he was Director of the Center for Research in Water Resources at The University of Texas at Austin. Professor Mays received the B.S. (1970) and M.S. (1971) degrees in civil engineering from the University of Missouri at Rolla, after which he served in the U.S. Army, (1970-1973) stationed at the Lawrence Livermore Laboratory in California. He received the Ph.D. in civil engineering from the University of Illinois at Urbana-Champaign in 1976. His research in the area of hydrosystems engineering has focused on the application of optimization and risk/reliability analysis to the design, management and operation of water infrastructure systems. The mentoring of graduate students has also been a major focus in his career having supervised to completion 37 Ph.D. students and many master’s degree students. His research has been published in over 125 refereed journal publications, another 120 proceeding papers for national and international meetings, and over 70 chapters in the books for which he was editor-in-chief. Professor Mays is the author, co-author, or editor-in-chief of over 23 books including the well-known textbooks Water Resources Engineering; Groundwater Hydrology; Applied Hydrology; Hydrosystems Engineering and Management; Ground and Surface Water Hydrology; and professional handbooks and reference books such as the Water Resources Handbook; Water Distribution Systems Handbook; Hydraulic Design Handbook; Water Resources Sustainability; Water Supply Systems Security; Urban Water Supply Handbook; and others. His interests over the last 20 years have expanded to the visiting many archaeological sites around the world, photographing and studying ancient water structures. He has published several articles on this topic and developed the book, Ancient Water Technologies. More recently he has been a co-editor of the new book, The Evolution of Water Supply Through the Millennia, published by the International Water Association. Professor Mays has done volunteer work for organizations such as the United Nations UNESCO-IHP in developing the book, Integrated Urban Water Management in Arid and Semi-Arid Regions. Other professional activities have included serving as a consultant to various government agencies and industries and serving as an expert witness in several litigations concerning flooding and other water-related issues. He is a registered professional engineer in several states in the US, a registered professional hydrologist with the American Institute of Hydrology, and a member of several professional associations. He is also a Fellow of the International Water Resources Association (IWRA), the American Society of Civil Engineers (ASCE), and the International Water Association. He has been a representative to the Universities Council on Water Resources (UCOWR) and has served on the Board of Directors of UCOWR and also as President. He has been elected a Diplomat of the American Academy of Water Resources Engineers and in 1999 received a Distinguished Alumnus Award from the Department of Civil Engineering at the University of Illinois at Urbana-Champaign. In June of 2014 Mays received the American Society of Civil Engineers Julian Hinds Award. 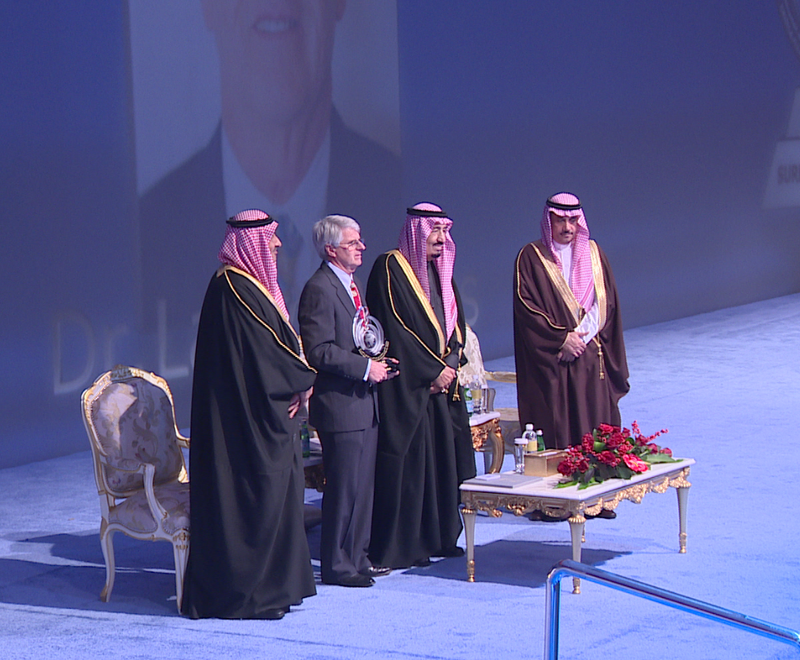 Later that year he received the Prince Sultan Bin Abdulaziz International Water Prize – Surface Water Prize in Riyadh, Saudi Arabia on December 15, 2014. The award was presented to him at the ceremony by Crown Prince Salmon Bin Abdulaziz (on Mays’ left in the picture below), who is now the King of Saudi Arabia. To Mays’ right is Prince Khaled Bin Sultan Bin Abdulaziz and on Mays’ far left is Abdul Malik Al-Asheikh. In June 2015 he received the Warren A. Hall Medal presented by the Universities Council on Water Resources (UCOWR). He was also elected Fellow of the International Water Association in 2015. In April 2016 he was inducted into the Academy of Civil Engineers of the Missouri Univeristy of Science and Technology (MUST) and in May 2016 he received the Ven T. Chow Award from the American Society of Civil Engineers.